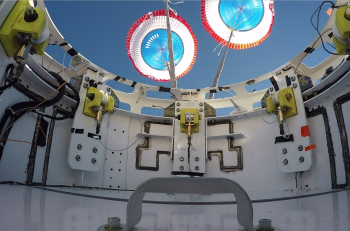 Boeing’s Starliner spacecraft is progressing through a series of parachute drop tests, refining the technology for returning the spacecraft back home safely. However, NASA’s safety advisory body has cited certification concerns about a major element for the spacecraft’s ride to space, specifically the RD-180 engine used by the Atlas V launch vehicle. The traditionally media-shy spacecraft has enjoyed a boost in publicity of late, centered around the reveal associated with the spacesuit astronauts will wear during launches to the International Space Station (ISS). The suit announcement thrust Starliner into the mainstream media, not least via a segment with comedian Stephen Colbert. However, it’s the nuts and bolts of the Starliner that remains the focus of Boeing’s progress towards becoming one half of the Commercial Crew Program’s goal of returning domestic crew launch capability to the United States. Starliner is behind CCP stablemate Dragon 2 in terms of milestones and schedule. However, progress on specific milestones provides positive news on being able to tick off the checklist ahead of an actual launch of American astronauts on an American spacecraft – a capability lost when Atlantis touched down at the end of her STS-135 mission in 2011. The latest test series relates to the landing element for Starliner, with flight-sized boilerplate of Boeing’s CST-100 Starliner touching down under parachutes against the backdrop of the San Andres Mountains. The opening test was conducted at Spaceport America, a facility desperate for action after patiently waiting for years for Virgin Galatic to host space tourism flights. 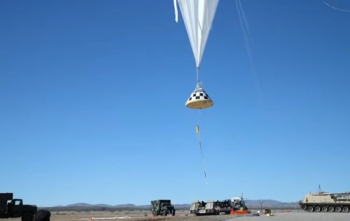 During the test, the Starliner was lifted about 40,000 feet in the air, the flying altitude of a typical commercial airline flight, by a Near Space Corp. helium balloon and then released over the White Sands Missile Range, next door to Spaceport America. Uniquely, this test wasn’t conducted via the use of a helicopter of an aircraft – as seen with other vehicles, such as the Orion spacecraft. Boeing was not able to fit the Starliner test article into the hold of a C-130 or C-17 aircraft, so they instead used a 1.3-million-cubic-foot balloon, which is able to lift the capsule to its intended altitude. The test went well, with Starliner released from the balloon, deploying two drogue parachutes at 28,000 feet to stabilize the spacecraft, then its pilot parachutes at 12,000 feet. The main parachutes followed at 8,000 feet above the ground prior to the jettison of the spacecraft’s base heat shield at 4,500 feet. Finally, the spacecraft successfully touched down. “Completion of this test campaign will bring Boeing and NASA one step closer to launching astronauts on an American vehicle and bringing them home safely,” said Mark Biesack, spacecraft systems lead for the agency’s Commercial Crew Program. Meanwhile, Starliner was mentioned at the latest Aerospace Safety Advisory Panel (ASAP) meeting, which mentioned the parachute tests as an important milestone for the spacecraft. “The ASAP looked carefully at the Boeing first crewed demo flight in August 2018. Many important milestones have been accomplished. Boeing had a successful parachute drop test and has more coming up,” noted the minutes from the meeting. As per usual, the ASAP referenced its current safety-related concerns, with Starliner failing to avoid the scrutiny of the traditionally conservative body. “During the fact-finding session, there was a good discussion of heat shield testing. The Boeing team is working on improving the heat shield performance,” added the minutes. Classed as a top risk, the ASAP cited an “issue” with Starliner’s launch vehicle of choice, the Atlas V.
This rocket is one of the most reliable vehicles in the world. However, there appears to be a problem with the paperwork side, specifically certification – based on the issue of the Atlas V main engine being a foreign piece of hardware. 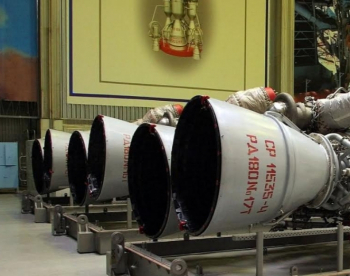 The RD-180 engine is built by RD AMROSS, a U.S. joint venture of Pratt & Whitney, located in West Palm Beach, Florida, and NPO Energomash of Khimki, Russia. Partly in responses geopolitical pressures, ULA contracted with Blue Origin for their BE-4 engine to serve ULA’s “next generation launch vehicle” which is the favored replacement engine of choice for ULA. 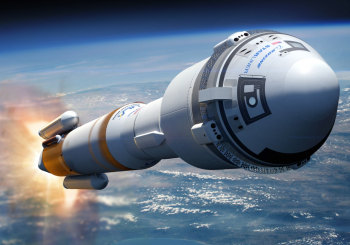 The BE-4 is set to be the main engine for ULA’s new launch vehicle, Vulcan. However, Starliner will initially launch with Atlas V, powered by her RD-180 main engine. As such, the certification issue is being worked on by Boeing, which is part of ULA. “One of the top Boeing risks is the RD-180 engine certification. The engine has a long history, but it has been difficult to get detailed design information for certification,” added the ASAP minutes. The current schedule shows the Boe-OFT flight, which will be an uncrewed test of the Boeing CST-100 spacecraft, will occur throughout June 2018. 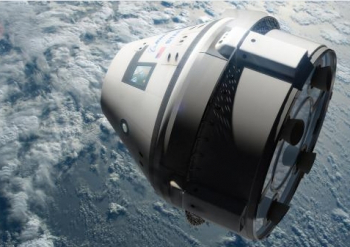 A roughly two-week crewed test flight of CST-100 will then occur in August 2018, ready for the start of limited operational commercial crew flights starting in late September 2018.